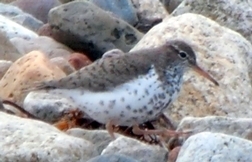 On Tuesday 19 May 2015 a Spotted Sandpiper, an American species, was photographed on the shore at Clauchlands. 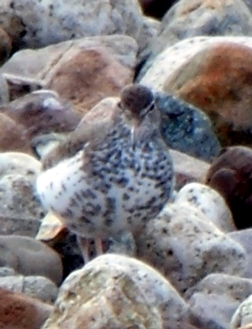 The original observer was initially somewhat dubious about the identification even though the photographs taken clearly showed the distinguishing features of the well named Spotted Sandpiper. A few days later on Thursday 21 May the bird was seen by other observers. It has not been seen since. This is the first ever report of this species on Arran. Like the more familiar Common Sandpiper that breeds along our shores in the summer, both the Common and the Spotted are long distant migrants. While the Common Sandpiper breeds in temperate Europe and Asia. wintering in Africa, Southern Asia and Australia, the Spotted Sandpiper breeds in North America ranging across Canada as well as the United States, wintering in Central and South America. 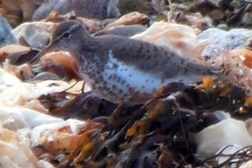 How did the Spotted Sandpiper get to Arran? At some stage when it has been migrating, either in the spring up the east coast of America or in the autumn down the east coast of America, stormy weather conditions have moved it across the Atlantic. Now it will continue to migrate on this side of the Atlantic. These birds are described as accidentals. Another appropriate term is "lost". There have been very occasional reports of pairing between Spotted and Common Sandpiper in the UK and one report of a breeding pair of Spotted Sandpiper in the Highland Region in 1975. In the UK the Spotted Sandpiper is rare. The first UK record was in 1849. Between 1950 and 2007 there were only 131 UK records. There are usually only two or three records a year. This year there was a juvenile in Aberdeenshire in January and in May an adult in Herefordshire as well as the bird on Arran. Last year there was one near the RSPB site at Baron's Haugh by Motherwell from 6 to 20 July. Whether or not that bird and the one on Arran this year are the same bird, is not known.